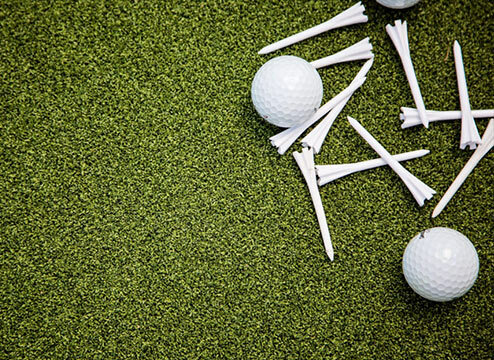 Hole, fore, bogey, birdie… you probably know all the terms for golfing, but do you know the language for putting green? 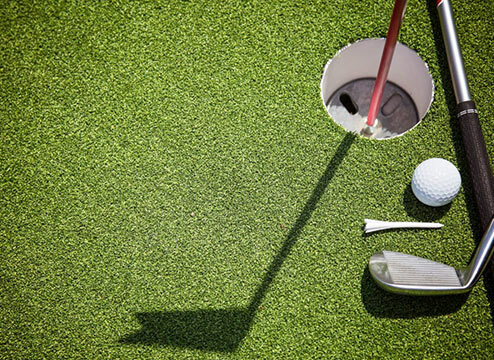 Learn everything you need to know about putting green turf to get your short game up to par. You know those terrible indoor putting green gifts in Skymall? The ones that cost thousands of dollars and show a guy in a big leather armchair and a tiny golf club? We won’t let you be that guy. Instead, look towards real putting green. The kind with artificial grass instead of weird putting green carpet. The kind where your ball always rolls true. The kind of putting green you want. You might not know how to buy putting green turf yet, but don’t worry, I’ll teach you everything you need to know. What is Putting Green Turf? 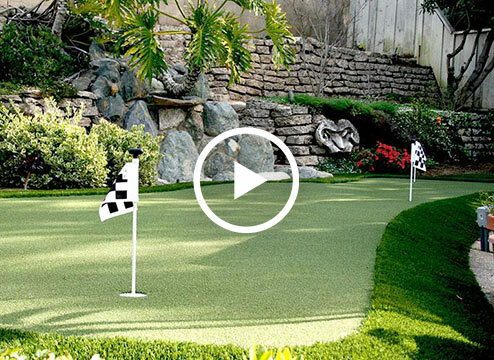 Putting green turf is a low-pile artificial grass that allows golf balls to roll true. It’s different than standard turf because it’s less thick, or lower pile, than the type of artificial grass on your lawn. Because its surface is thinner and the pile is tight, the golf ball is able to roll and stop like it would on natural Bentgrass. For a little bit more about what artificial grass even is, I’ve got a helpful video. Now that you know the very basics of putting green, it’s time to talk technical. That’s right. Here comes the terminology. Face weight is pretty important when it comes to fake grass. The face weight is the amount of material used per square yard in your artificial grass. For putting green, the optimal face weight is between 40 and 60 ounces. The higher the face weight, the more material is used, which means a longer lasting putting green. One of the more important qualities of your putting green is the pile height. Pile height is the thickness of your turf. Putting green should have a low pile height to ensure your ball rolls true. Imagine hacking away in tall grass. Yikes. 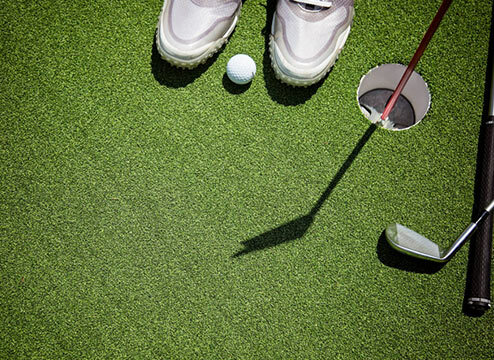 Most putting green surfaces are ½” thick to ¾” thick. Before you purchase your putting green, make sure it is suitable for the environment it’ll be in. Most putting green can be installed indoors and outdoors, but it’s good to check to make sure. For example, indoor putting green might have nylon fibers, which can fade in direct sunlight. Double-check the label before you buy. A stimp reading tells you how fast the ball will roll on putting green. The higher the stimp reading, the faster the ball will roll. Stimp readings can vary depending on how putting green is installed, but most of the stimp readings on our putting green turf is a 9 to an 11. If you want the ball to roll slower or faster, there are ways to manipulate your putting green. For example, you could add more infill or brush the turf. I doubt I need to tell you about the benefits of owning putting green - by now I'm sure you’ve imagined all of them! Maintenance-free: One of the best things about artificial grass is that you don’t have to mow or water it. All that labor is gone. You can just golf. Forever green: When you think of golf, you think of rolling green hills. Our putting green stays forever green just like you remember it. Great practice: Perhaps most importantly, you get to practice your short game without leaving your home. Great fun: It’s also FUN! Teach your kids how to put, or just have some friends over. Remember to have fun on your putting green. Everything has its limitations, and artificial putting green is no different. Let’s look at some potential hiccups when it comes to buying putting green. Expense: Buying putting green can have a steep upfront cost, but that also depends on how much area you are dedicating to your golfing zone. Additionally, it lasts for years. In the long term, it pays for itself. Heat: It can get hot out there, and unfortunately outdoor putting green can get a little hot from the sun. Overall, artificial grass is hotter to the touch than real grass. Alright, now that you’re ready to choose your putting green, let me gather the best info on our products to make the process easy. Let’s go! This product has putting green right in the name, so you know it’s good. These turf rolls allow golf balls to roll true. It has a stimp reading between 9 and 11, and you can adjust that with more infill or a power broom. You can also cut it to the size you need. This is the cream of the crop when it comes to putting green! Launch turf rolls are great for your indoor putting green. They require no infill and are simply rolled out and secured with double-sided tape. Since they are UV stable, they can even be installed outdoors, but we recommend them for indoor use for putting green. This product is super cool because you can customize the size of your putting green very easily. Simply lock the tiles together like a puzzle piece and you’re on your way! These turf tiles are indoor use only, but they’re heavy duty in thickness and weight. These turf rolls are recommended for indoor use only. They have a great pile height for a great putting green. Even better, they’re easy to install. They’re not the highest face weight around, but these turf rolls will get the job done. Adrenaline Turf Rolls are perfect for indoor use. Also, they have the perfect thickness for putting green. Best yet, these rolls are super easy to install. With near-perfect score, these turf rolls are up to par. Alright, now that you know everything you need to know about putting green, it's time to set up your own putting paradise and get swinging. You’re on your way towards your perfect game.